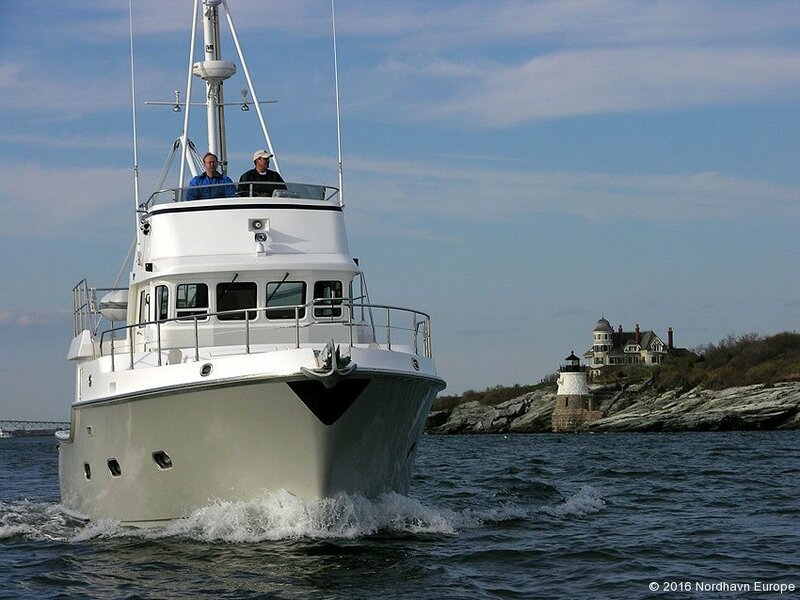 There are few boats so uniquely qualified to take two people and their guests around the world as comfortably and as economically as the Nordhavn 40. 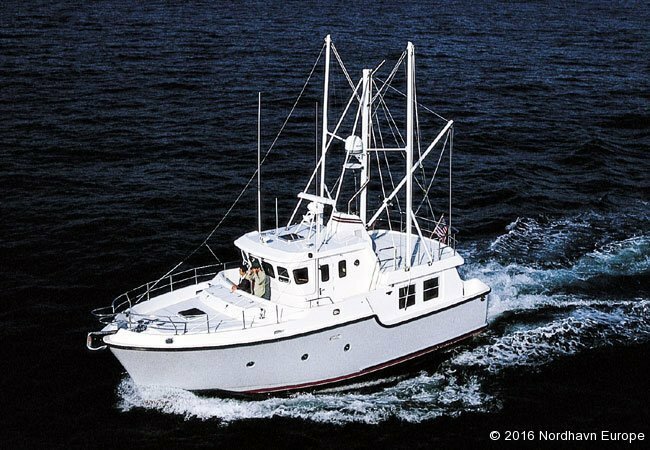 Strong, rugged and handsome in a no-nonsense way, her special personality was inspired by salty commercial ships fishing the world’s deepest oceans. 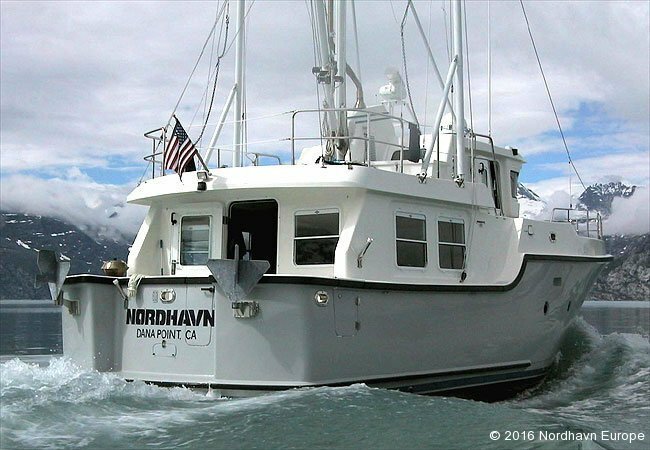 She stirs a passionate interest and curiosity along docks and throughout anchorages everywhere, with people enthusiastically asking her crew “where have you been” and “where are you headed?” Indeed, the Nordhavn 40 looks like the serious passagemaker that she is. 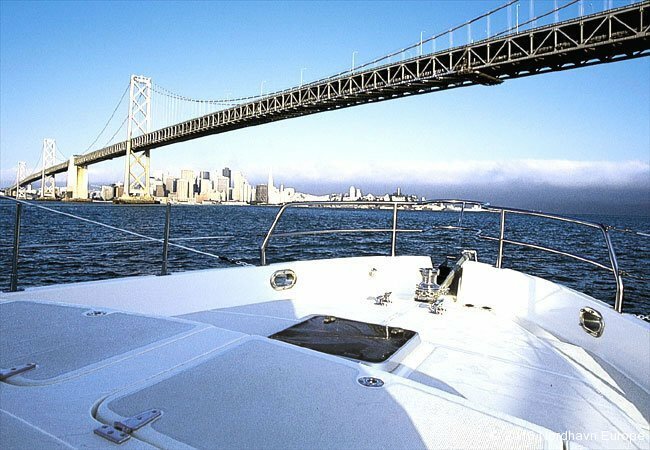 But above all her seriousness of purpose, there is a wonderfully romantic, emotional element to the boat that strongly attracts a wide base of seasoned sailors, experienced power boaters and those just entering the world of boating. Depending on weather, the actual performance can fluctuate for better or worse. On the run from California to Hawaii, the ATW boat pushed through contrary winds and currents which negatively impacted its output. However, when experiencing favorable seas in the Western Pacific, the boat made 7.4 knots at 2.6 GPH. Previously published numbers were based on tests of an unstabilized, lightly loaded boat in favorable conditions. More important than her range is her impressive seakeeping ability. This stout, tough ship is designed to punch through heavy head seas without hesitation and to track down swell as if on rails. Her high bow provides extraordinary buoyancy and contributes to her dry ride. Beneath the surface her forefoot of moderate depth eliminates pounding and helps provide a smooth, gentle motion. 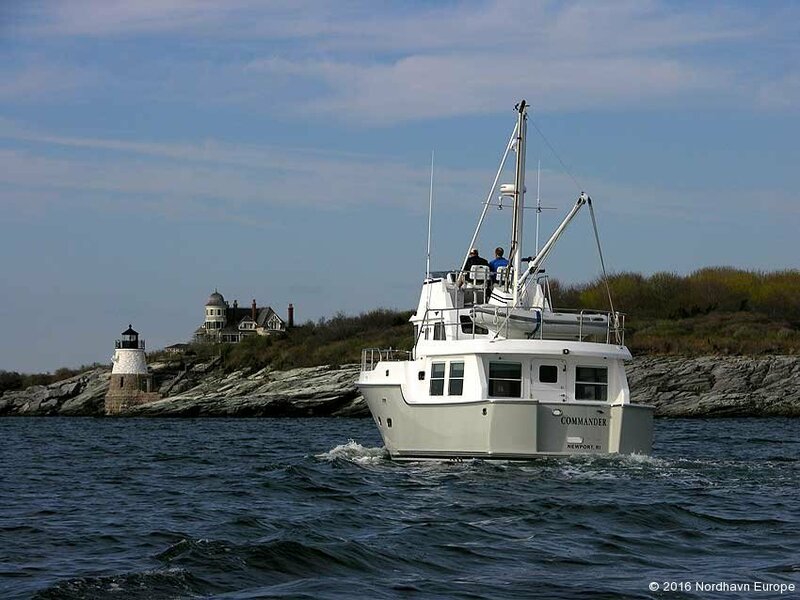 Her long keel with a large, protected rudder keeps her going exactly where she’s pointed. 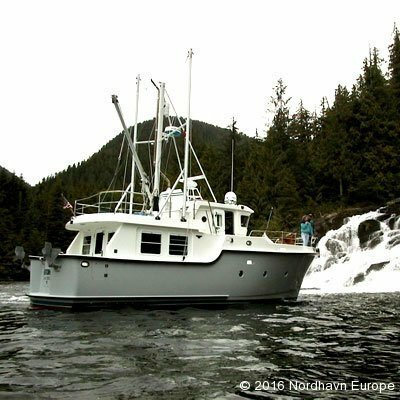 When equipped with Nordhavn’s highly dependable TPS (Towed Passive Stabilizers) or gyro-controlled fins, side roll caused by beam seas is minimized, greatly enhancing the comfort of her captain and crew. 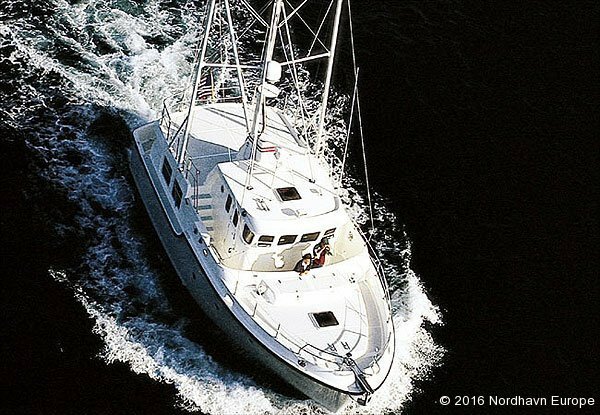 Even if her owner’s cruising plans do not include crossing oceans, the Nordhavn 40’s remarkable capabilities will be greatly appreciated and utilized during long-range, coastal cruising. 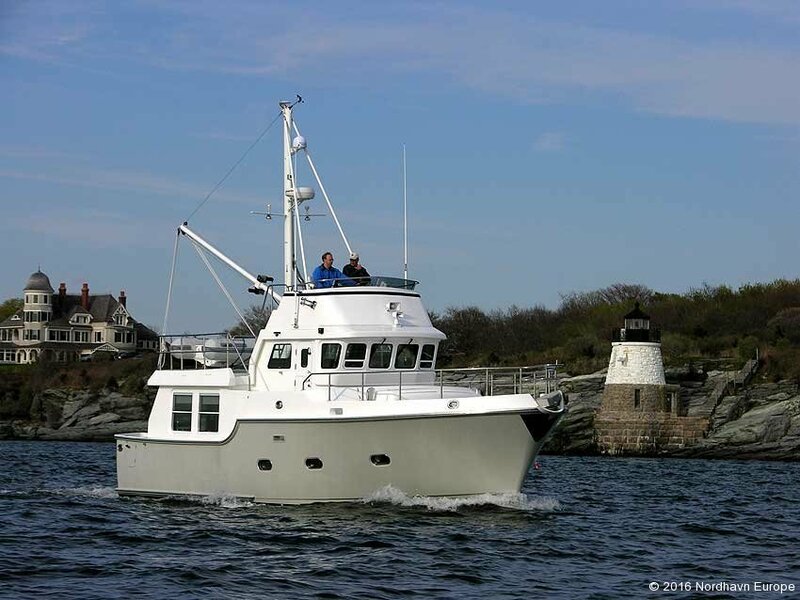 Her solid, seaworthy performance instills confidence in the captain and a sense of safety in the crew. Being caught in an afternoon squall on Lake Michigan or in a nasty Nor’easter while crossing the Gulf Stream, her crew will continue on, knowing their ship can take whatever the sea delivers. Start with a generous beam of l4′ 6,” add a relatively high profile with lots of hull below the waterline and mix in P.A.E.’s twenty years of experience building the ever-popular line of Mason sailboats, and it becomes easier to understand how the Nordhavn 40 can provide such spacious accommodations. 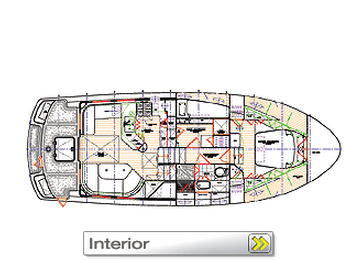 Her overall interior volume is, in fact, similar to that of many boats in the 45 to 50 foot range. 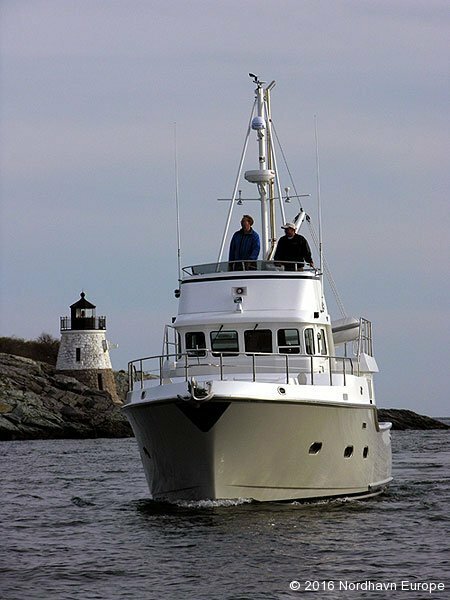 A large, luxurious owner’s cabin with a center island berth measuring 58″ x 79″ is located forward. 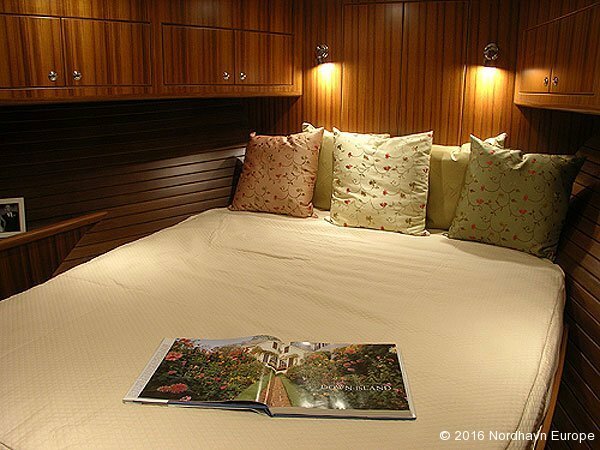 A guest stateroom features an upper berth and a lower. It has room for a washer and dryer and offers abundant stowage. The conveniently located head features a separate stall shower. The cozy main saloon seats four or more at the dining table with built-in settee, and another settee on the port side. During extended cruising, the fully-equipped galley provides the chef with all the conveniences of home, including a full-size refrigerator, freezer and optional trash compactor, a microwave oven, 3-burner stove and a double stainless steel sink. 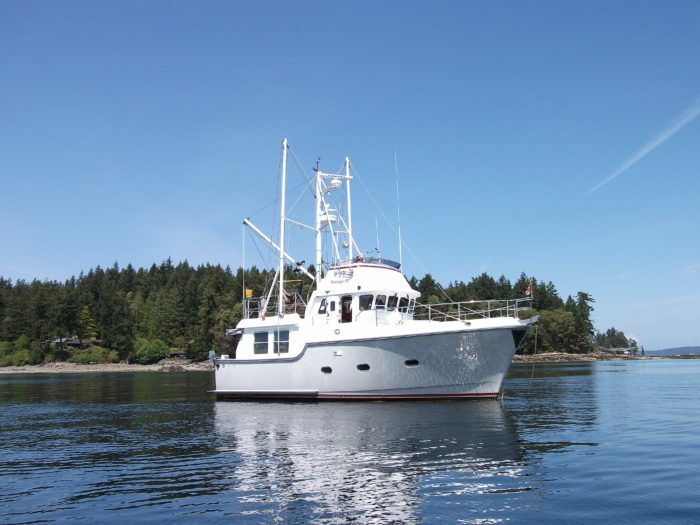 Adjacent to the dining area and near the steps to the wheelhouse, the galley is conveniently located for easy serving. 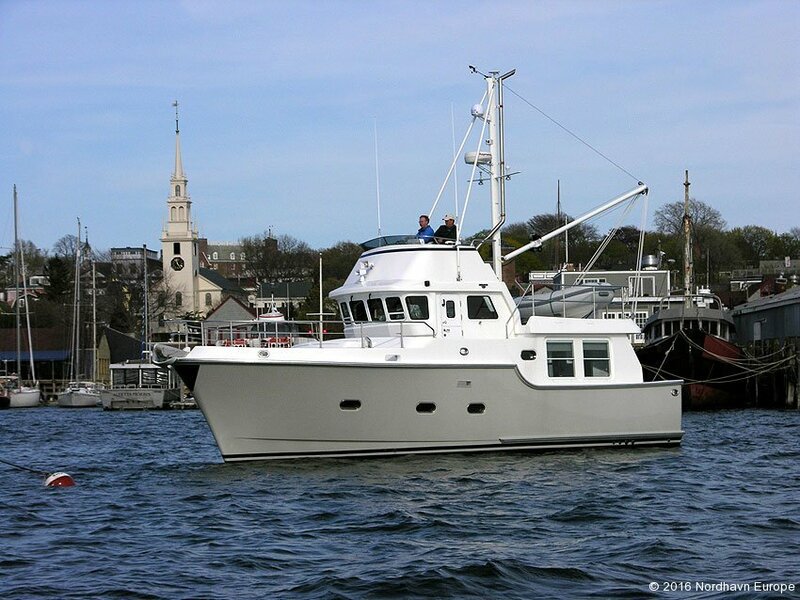 The area that truly separates the Nordhavn 40 from so many “coastal cruisers” is her commercial-like wheelhouse. Up three steps from the main saloon, the captain has a full view of his ship with all instruments, controls and navigation equipment within easy reach. High-quality tempered safety glass is used throughout, and the forward facing windows are 3/8″ thick. Two of the windows have opening lower panels for ventilation. The “Dutch-Doors” that open to the port and starboard side decks are an especially nice touch. Cruising along in a bit of weather, the bottom sections can be closed to provide protection while the top sections remain open for better visibility and air flow. 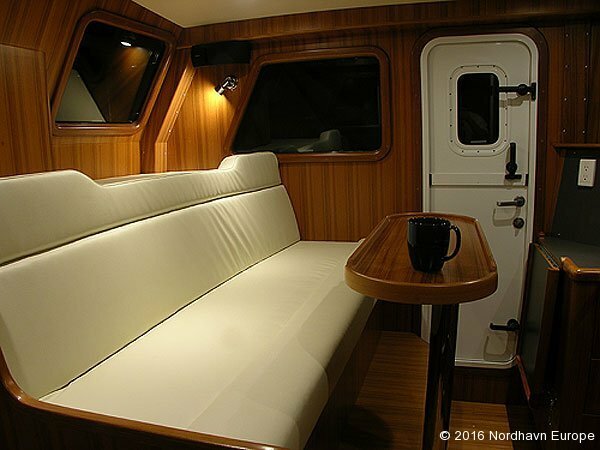 A raised settee with a dinette table provides the crew with the perfect spot to enjoy the voyage. An overhead hatch is included for added light and ventilation. 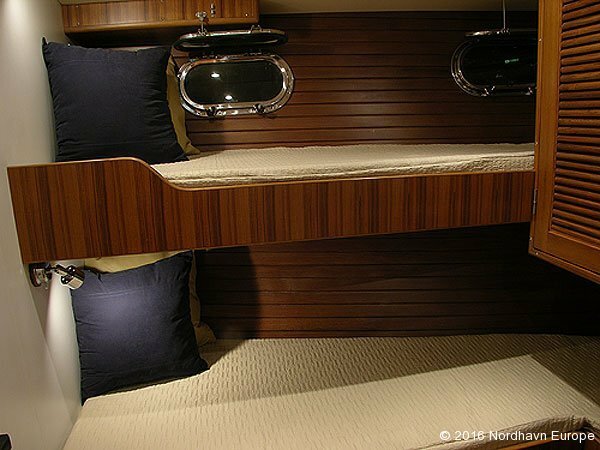 For overnight passages or that extra guest, a pilot berth aft of the settee comes in very handy. Many guests actually prefer this area for sleeping. Waking up to a panoramic view of the open ocean or a beautiful anchorage is an experience Nordhavn 40 owners seldom forget. 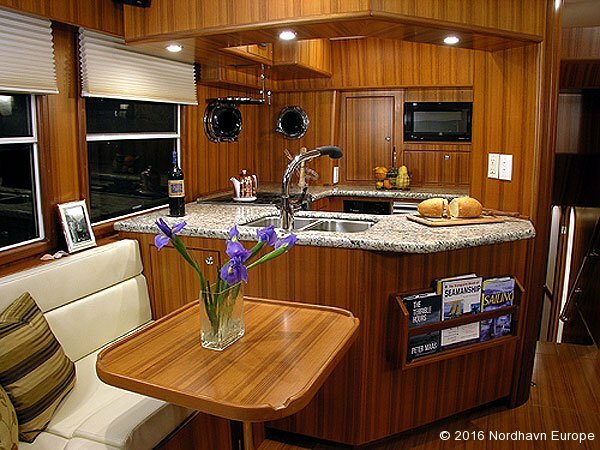 The spacious feeling one gets on the Nordhavn 40 is partly due to the generous dimensions allotted to passageways and overhead clearances. Headroom in the main saloon is 6′ 3″ and all passageways measure 24″ in width. 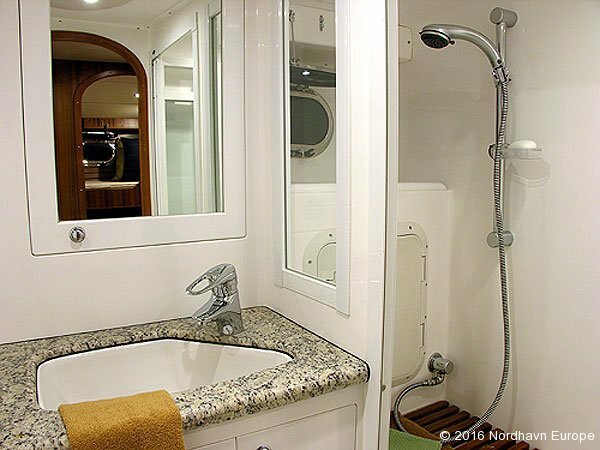 The door to the head is a decent 20″ wide, and the shower boasts 6′ 4″ of headroom, as does the forward stateroom. Innovative space design is only part of the Nordhavn 40’s magic. Beyond the imaginative layouts are a level of workmanship and choice of materials that put this little ship in the quality category of today’s finest mega-yachts. Satin-finished teak cabinets, bulkheads and trim are used throughout, and to maintain a cheery sense of brightness on those dark and dreary days, light-colored laminates are used on selected bulkheads and paneling. 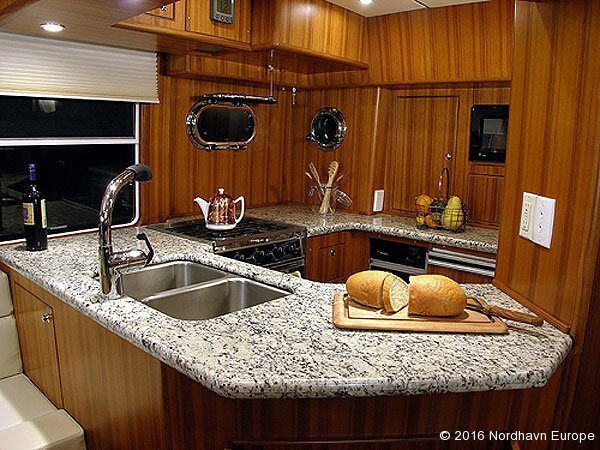 Granite countertops are used in the galley and head, and teak fiddles are an integral part of all counters and tables. Cabin soles are finished with teak and spruce flooring in all rooms except the head. Attractive overhead lighting fixtures utilize convenient wall switches that control lighting in each cabin, and additional reading lamps are installed over berths and settees. From the details of her wheelhouse to her overall deck configuration, the Nordhavn 40’s design team has thought of everything to make cruising safer and more enjoyable for her captain and crew. The central location of the wheelhouse not only provides excellent visibility and a gentle motion at sea, it allows for stress-free docking maneuvers by having the helmsperson within easy reach of amidships cleats. The back-angled windows are able to withstand heavy seas, and they also help reduce heat and glare. Wrapping around the forward part of the wheelhouse is a Portuguese bridge that is an ideal, protected place to keep watch or simply enjoy the view. Its solid coaming structure is designed to deflect boarding seas up and away from the sloping windows, making it difficult for water to hit the glass perpendicularly. Moving forward, two large deck lockers are ideal for stowing lines and fenders. Heavy-gauge, stainless steel safety rails provide sturdy protection all the way to the anchor platform, and a sunken anchor well with inboard deck drains eliminates mud or sand from traveling down the decks or hull. True to the form of a serious cruiser, a heavy-duty, stainless steel, double bow roller and combination chain and line windlass are standard. Access to the aft upper deck is by a molded stairway on the starboard side and by a short ladder on the port side. On the aft deck, an 11-foot dinghy can be stowed with its outboard attached, and a boom and mast system is equipped with an electrical winch for easy launching of the dinghy. With some imagination, there’s even room for kayaks, bicycles and more. One discovers the ingenuity of many Nordhavn 40 details only after spending time on board. The available twin lockers on the upper deck not only provide plenty of stowage, they provide a private place to sit and watch the world go by while underway. And once the dinghy is launched, the roomy aft deck can be the center of social activity, providing guests with a wonderful view of the harbor. The more time one spends on this unique vessel, the more one appreciates how many different places there are to “get away” from the rest of the crew and enjoy one’s privacy. After all, if the cruising lifestyle is to be successful, it’s important that every member of the crew have his or her “space.”The aft cockpit is another ideal place to sit while underway or relax at dockside. Two comfortable, forward-facing seats are molded into the transom, and beneath each seat is a stowage locker. Both seats are protected from the wind by the cabin, and the upper deck provides partial overhead protection. Turn on the barbecue, pour a refreshing beverage and enjoy the incredible view. There’s even room to add a couple of folding chairs. And when it’s time for a swim, the easy-access transom door leads to the integral swim platform and swing-down ladder. Under the floor of the aft cockpit, a cavernous lazarette provides access to the rudder shaft and steering mechanism while also offering a huge amount of room for stowing gear, supplies and equipment. 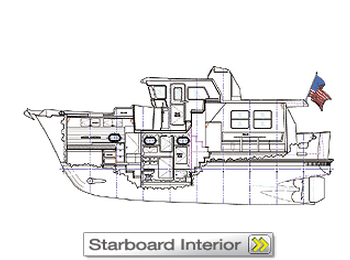 There’s room for a watermaker, diving compressor, tanks, storm anchors and more. The beauty of the Nordhavn 40 is in the details. And the details all follow the theme of safe, enjoyable cruising. 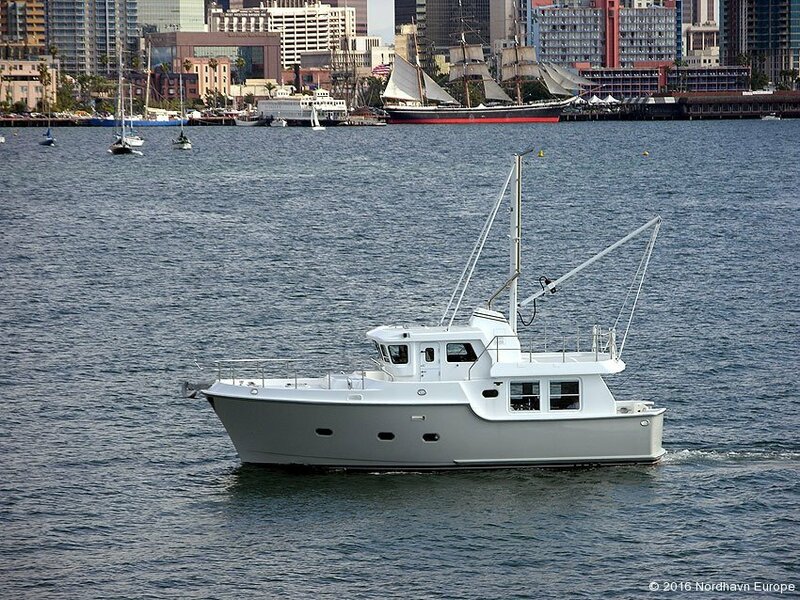 The Nordhavn 40 engine room houses the main propulsion engine, fuel tanks, fuel management system, an optional auxiliary “wing” engine and the AC generator. At the center of it all is the John Deere-based Lugger 6-cylinder diesel engine that has proven to be one of the most reliable marine engines ever produced. Indeed, these Luggers have been known to run over 80,000 hours between overhauls. (A typical two-year, around-the-world voyage requires between 5,000 and 6,000 hours.) A foolproof fuel management system utilizing a two-gallon supply reservoir allows fuel to drain into it from the bottom of each of two 460-gallon molded fiberglass tanks. The reservoir allows water and heavy contaminants to be collected and drained off before ever reaching the main filters. A water alarm is included in the reservoir, and a sight gauge allows easy, l5-minute consumption tests, insuring accurate fuel management. All but one gallon of diesel fuel of the total 920 is isolated and the rest will drain free-of-air into the reservoir despite the motion of the vessel. The fuel tanks are securely fiberglassed into the hull and have l8″ by l8″ inspection plates and removable baffle panels, so a man can easily access every inch of the tank’s interior for cleaning and inspection. The construction of these tanks eliminates corrosion, dramatically reduces condensation, adds to the vessel’s rigidity, reduces noise; and they’ll last the lifetime of the vessel. Although the reliability of single-engine installations has been proven by scores of successful circumnavigations, some owners may wish to opt for an auxiliary “wing” engine. 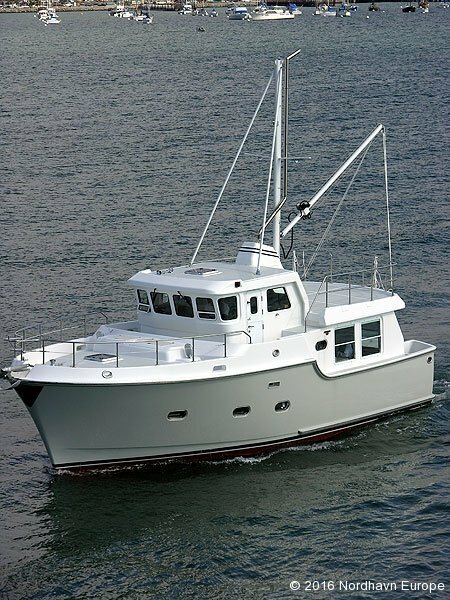 This “get home” package features a totally separate 27 hp diesel engine with its own independent electrical system, separate l0 gallon day tank, transmission, shaft and propeller. This engine will drive the vessel at 6 knots in calm weather (3 to 4 knots in difficult conditions) and will maintain an electrical charge to the house system. To further enhance overall reliability, P.A.E. 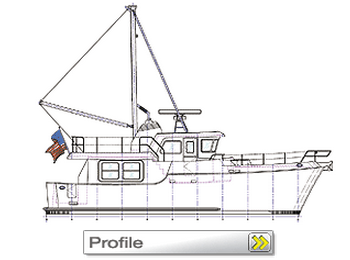 has incorporated a keel cooling system and dry exhaust for the main engine. These two systems eliminate the raw water thru-hull, hoses, strainer, heat exchanger, vented loops, raw water pump, associated belts and hot, noisy exhaust hoses. The engine is cooled through a series of tubes recessed in the hull, totally eliminating any salt water from entering the engine. Instead of a traditional wet exhaust system, a specially engineered dry system exits the exhaust high above the upper deck, greatly reducing noise and fumes. Because the vessel is expected to run for days at a time, every effort has been made to reduce vibration and noise. Indeed the level of noise from the engine measured in the wheelhouse or main saloon is actually lower than that of a quiet conversation. 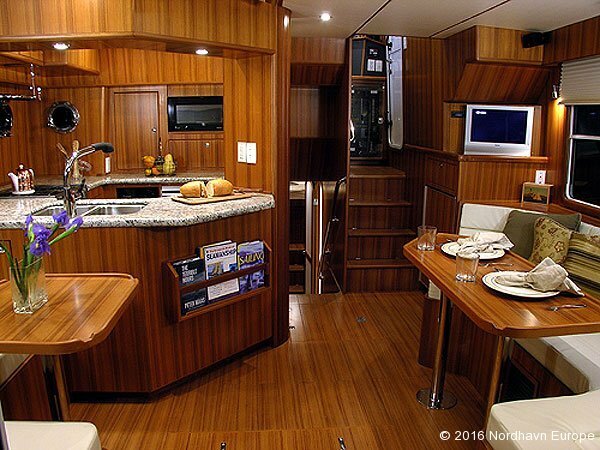 On a Nordhavn 40, the loudest noise heard is often the sound of the water rushing by outside. The AC/DC distribution panel utilizes high-quality, marine-grade components. All wiring is color coded to ABYC standards, and sizable conduits are provided for future installations. All galley and head AC outlets are GFCI type. 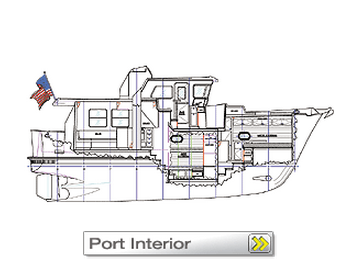 Thru-hulls are bonded and tied into the l2-volt system, as is all hardware below the waterline. Two large zinc plates are also tied into the l2-volt ground system. 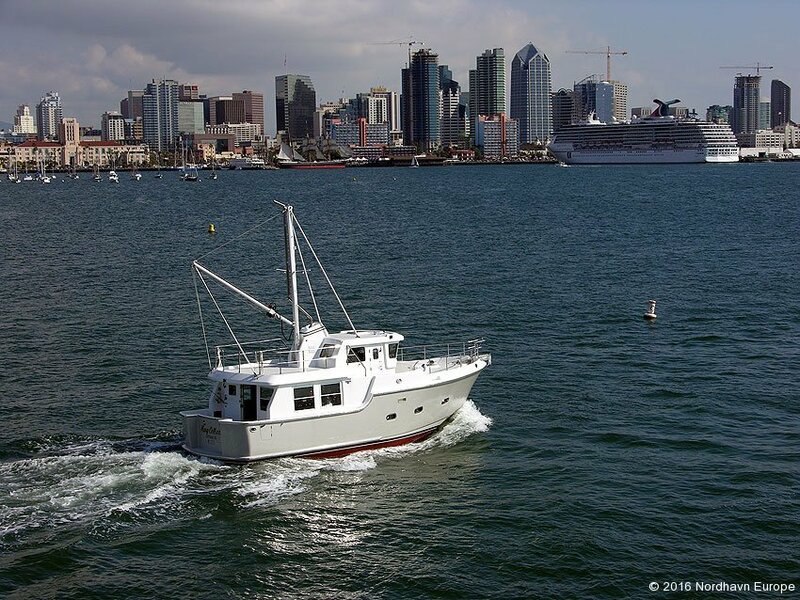 Mechanically and electrically, the Nordhavn 40 is engineered to provide years of trouble-free service even in the most demanding, marine environment. Cabin top and deck (horizontal surface): E.G.B. 9-12 lb per sq. ft.
Mattresses: Two (2) foam with standard upholstery on upper and lower bunks. Vent lines are fuel certified, reinforced hose 3/4″ (1.9 cm) I.D. Bow Roller: Stainless steel double bow roller designed to accommodate a 60 lbs (22.4 kg) CQR anchor on starboard roller and the port roller to be designed for a second light anchor or for mooring lines. Roller on starboard side to be slotted for chain and the port roller to be smooth for line.